What a wonderful post! Sometimes I think we two should meet at a mystery con and just talk for hours and hours. I have this collection and it's been WAY too long since I read it! I can see it's spine from where I sit. I love the Bantam covers you found for this post, I don't remember seeing them. But them I have a bunch of newer pb editions, plus s few omnibus editions. Yes, by golly, I'm going to put this on my TBR stack today! I bet we would talk up a storm, Rick. :) Though my memory of books I've read now has to be jogged a bit here and there. I try to do without going to google, but to no avail. 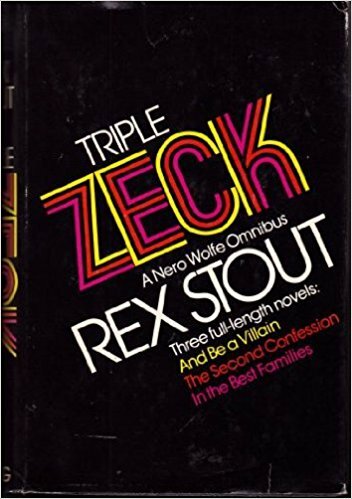 I read the Zeck trilogy all the way through every few years. 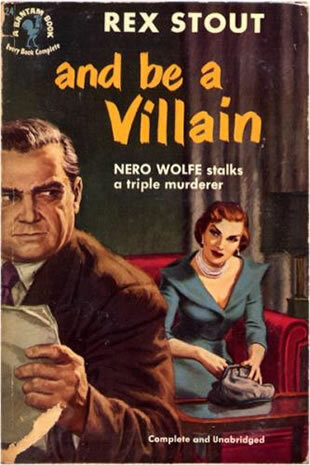 Though my most favorite Wolfe book remains: MIGHT AS WELL BE DEAD which I read about twice a year. Thanks for the kind words. Twice a year! I don't even recall the plot. This is the book where one of Wolfe's men meets his maker. That's all I'll say. But I love the book. I was just recently debating whether this group of three books featuring Zeck would be on my top ten list. I like the first one and the last one best (of those three), but it has been a while since I read them. I am going to have to read MIGHT AS WELL BE DEAD again soon, to see if I need to move it up to my top 10 list. It's funny, Tracy, because PLOT IT YOURSELF and MURDER BY THE BOOK were my two favorites for a long while. But then MIGHT AS WELL BE DEAD usurped their place. I don't place the Zeck books on my Top Ten. But I still enjoy rereading them. Though I must say that that first one in the trilogy is a doozy. Oh, and THE SILENT SPEAKER is high up there as well. 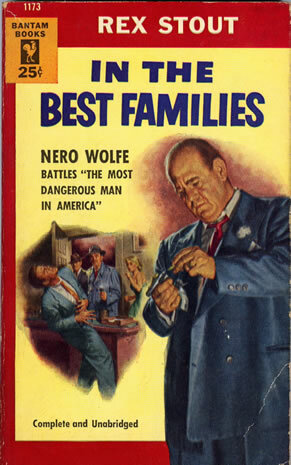 IN THE BEST FAMILIES has forever been my favorite Wolfe novel, not least because it represents the most radical departure from Stout's usual format, but also because--and there are many readers who'll argue this point with me--it's one of the relatively few fair-play novel-length whodunits in the corpus. Really?? Even with all the coincidences? The last ending is gut-wrenching and the next to the last ending is nail-biting fun. And of course, Wolfe's resources - both mental and physical are mind-boggling. You're welcome, Mudpuddle. I think a used copy is easy enough to find online. At least, I hope so. :) I've had mine for a few years. The Doorbell Rang is still my favorite. I almost forgot about this trilogy and think I might have to reread it soon. Thanks for the reminder. That's one of my Top Ten books too, Gram - THE DOORBELL RANG, I mean. Ack..Zeck!!! You've sold me, Yvette. I must read this trilogy! My problem lately is reading books recommended by fellow FFBers and then feeling odd about trying to review them. But...I cannot overlook these three books! Zeck!!! No, you cannot overlook these three books. Definitely. :) I don't think anyone minds reviews of their recommendations - makes sense that if you like the book, you'd want to talk about it. Well, I couldn't get the Zeck (love that name!) omnibus, so I downloaded the three Kindle versions. Yvette, a delightful post and a very timely one for me. My wife and I are currently watching the Nero Wolfe TV series with Maury Chaykin and Timothy Hutton. As a big Nero fan, what did you think of those adaptations? I liked the series well enough, Rick. Though I didn't see all of the episodes. But I didn't love them as much as other Wolfe fans did. Can't put my finger on why. I did love Maury Chaykin as Wolfe though - his facial expressions are priceless. And I love the guy who played Saul Panzer. We have enjoyed the series immensely, mostly because of the performances, characters, costumes, and settings. 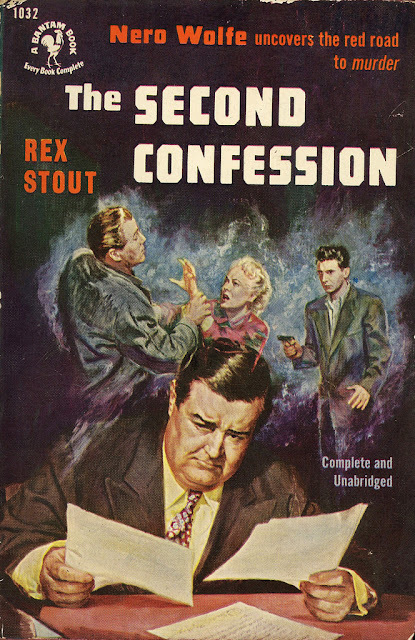 The plots seem faithful, but the mysteries don't seem as strong as in Stout's novels. This was wonderful to read! Why do I have a bad feeling about the Families book? I know I haven't read it, and I think I stayed away because of something I read about it. The last time I read Stout was (I think) seven years ago, and the bulk of my reading was in the early 2000s. I was swept away. I listened to audiotapes and just loved the books. Maybe you're mixing that up with A FAMILY AFFAIR? I wouldn't read it. It's the one book I only reread twice and would never bother with it again. To me, it was a totally unnecessary betrayal of Wolfe's devoted fans. But the rest of the books in the series are pretty wonderful - a few even rise to greatness. I reread my favorites several times a year and I never tire of them. In fact, I'm currently rereading IN THE BEST FAMILIES and enjoying it once again. I read book two, not the other two. But I want to read the third one, sounds good. And I need a distraction from a family crisis. Nothing like a Goodwin/Wolfe pick-me-up. I finished the third book yesterday, so read the three of them straight through. What fun! Though I'd read them all before, for some reason I had only the faintest memory of BEST OF FAMILIES so it was a special treat, coincidences, unlikelihoods and all. Thank you again for this set of reviews!